Sonoma holds a special place in my wine story. For a couple of years, we managed to add a visit to Sonoma and Napa wine country along with a Bay Area conference I was going to for work. The timing was great. I was just starting to learn to cook, and we were starting to pay more attention to the wine we were enjoying with the food I was cooking. Visits to Sonoma wineries helped me appreciate more about the process of making wine, and start to learn how the climate and terroir in the vineyard contributed to what I was tasting in the glass. Though it’s been over ten years since we’ve been to California (we have a 12 year old, no coincidence), I still have vivid memories of driving along the Russian River and searching out the next winery to visit. The last time we were there, we were staying in a little place in Jenner, where the Russian River empties into the Pacific. We’d stop at a wine and cheese shop in Duncan Mills on the way back to our hotel, and pick up some local cheese and wine. Though I’ve certainly come to appreciate the broader range of wine produced in Sonoma County, I particularly remember sipping Russian River Chardonnay as we nibbled on crackers with soft cheese, and watched the seals play by the mouth of the river as the sun started to sink into the Pacific. With these good memories of Sonoma County, it was horrible to hear about the devastating fires that raged this past fall. The Sonoma fires have received extensive coverage, so I won’t say much more other than to link over a piece written by one of my fellow #winePW bloggers, Michelle Williams, who was visiting Sonoma when the fires broke out. The good news is, the people of Sonoma are resilient, and have pulled together to support each other during and after the fires. The tag #SonomaStrong captures that spirit, and we are pleased to use it today as we focus on some wonderful wines from Sonoma and food pairings to go with them. Geyser Peak Winery has a long history of making wine in Sonoma, going back to 1880 when it was founded as California’s 29th bonded winery. The original winery was located on a hillside across from Geyser Peak Mountain, giving it a view of thermal steam clouds around the mountain summit. For more background on the winery, visit the Geyser Peak Winery website. We decided to focus our #SonomaStrong Wine Pairing Weekend post on the 2016 Geyser Peak River Ranches Sauvignon Blanc ($22, 13.5% ABV). Well, OK, nature played a role in helping us make that decision…more on that in a moment. Grapefruit is often a tasting note associated with Sauvignon Blanc, and I got grapefruit on the nose of the River Ranches Sauv Blanc before starting to sip. The wine has a bright citrus fruit taste, I get a bit of kiwi. Refreshing and well-balanced, with mineral notes. The tasting notes on the bottle also mention basil, and I definitely get a bit of herbal element too. I started my tasting notes by mentioning grapefruit, so I have to say I’m someone who is turned off by a very strong grapefruit element in some Sauv Blancs, notably from New Zealand. However, in this wine, the grapefruit aspect is balanced by other flavor elements, so it is enough to give it a refreshing element without dominating. 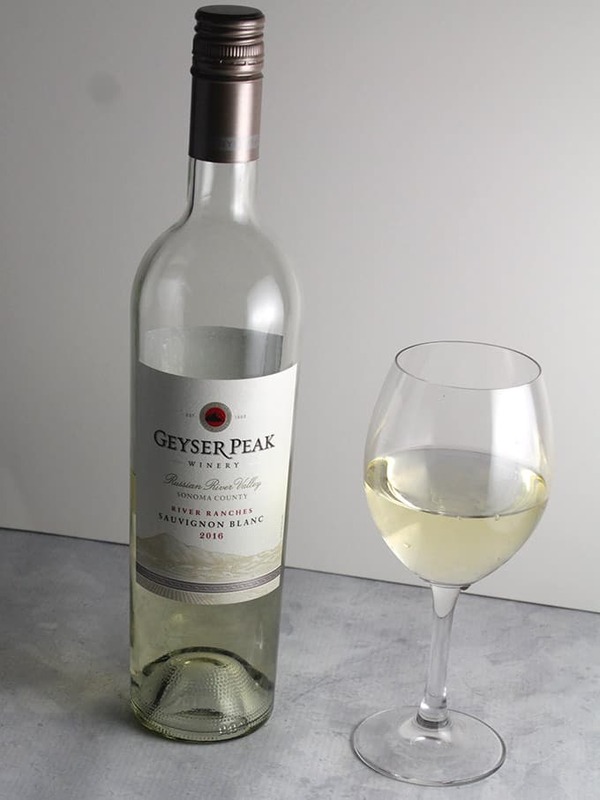 I would definitely say this wine from Geyser Peak is pleasant to sip on its own, and improves further with a good food pairing. When I saw a Sauvignon Blanc was to be included in the wines we were to sample for this #winePW event, my mind immediately went to pesto. I love pesto of various sorts, and pesto and Sauvignon Blanc are a classic pairing, in fact that link takes you to one of my first #winePW posts which involved another Russian River Sauv Blanc. 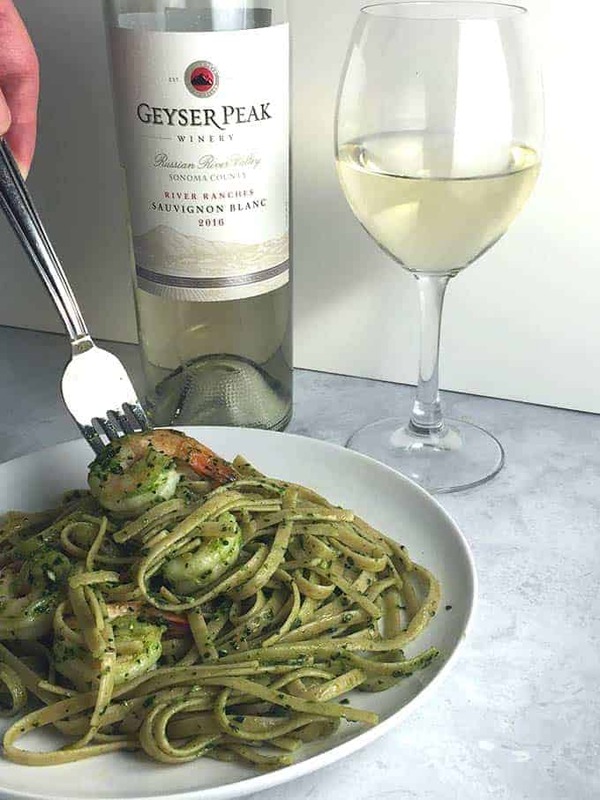 The pairing ideas on the Geyser Peak Sauvignon Blanc label also mentions shellfish, and that led me to pairing their River Ranches Sauvignon Blanc with Shrimp Pesto Pasta. 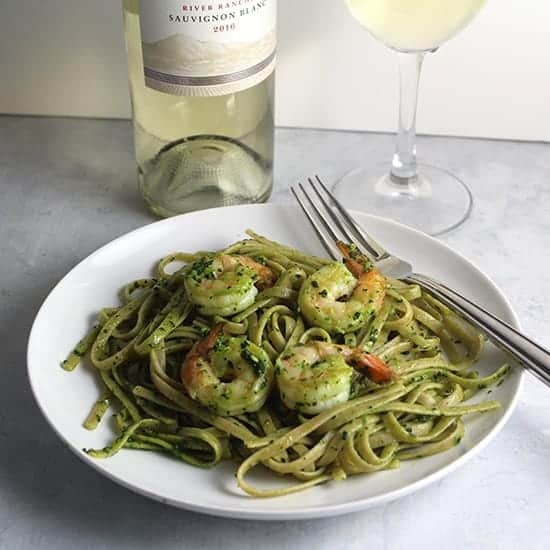 As you might suspect, the crisp Sauvignon Blanc paired very well with the pesto, and the mineral tones worked well with the shrimp. I definitely rate this pairing an “A”! The food and wine make each other better in a grade A wine pairing. I didn’t get a chance to sample wine from Balletto Vineyards for this #winePW event, but I have enjoyed their wine in the past. We loved the Balletto Vineyards Russian River Chardonnay paired with our Orzo Salad with Kale Pesto recipe. We also had a chance to enjoy Balletto Rosé of Pinot Noir Easy Baked Tandoori Chicken. What happens when wine freezes? We must briefly depart our happy story of great wine from Sonoma County and food that pairs with that wine to speak of the fate of the other 3 bottles intended for this event. Unfortunately, the wine was being shipped from Sonoma across the US to me in the Boston area during a time when much of the country, including us, were dealing with extreme cold. Generally, heat is worse for wine than cold, but single digit temps are not recommended. If you leave wine in the car overnight and it freezes a bit, you might be OK after bringing that wine back to serving temperature for awhile. But of course, when liquid freezes it expands and thus puts pressure on the cork. The other bottle from Geyser Peak had the cork partially disgorged. I figured it was worth trying, because if the cork was disgorged fairly recently it might still be OK. But alas, clearly air had enough time to damage the wine. The other sample package included one bottle where the cork had completely popped out and emptied out the wine, as evidenced by the smell of the cardboard package. I thought we might have a shot with the other bottle, as I couldn’t see notable cork damage. But clearly air had gotten to this one too. Fortunately, the Geyser Peak Sauvignon Blanc comes with a screw cap, which managed to withstand the freezing temps! The freezing of the wine itself didn’t seem to cause damage, the problems happen when the cork is damaged in the freezing process. Two morals of this story. First, don’t leave your wine out in the car overnight in the winter! Second, if you are shipping wine, take precautions to protect the wine against extreme temperatures. Making shrimp pesto pasta is quite easy, and you can get this on the table in about 30 minutes. As you will see here, I made the shrimp pesto pasta with kale pesto. You can certainly use classic basil pesto here if you like, I have linked over to my recipe. Also, the kale pesto recipe as given is nut free, as we are going all nut free in our house now due to a food allergy. Feel free to use pine nuts in the kale pesto if you prefer to my pumpkin seed idea. Get the kale pesto made first, then get ready to cook the shrimp. My recipe steps for shrimp pesto pasta toggle between cooking the shrimp and the pasta, so that things are ready at roughly the same time. If you can multitask between checking a text on your phone while watching TV, you can handle this! 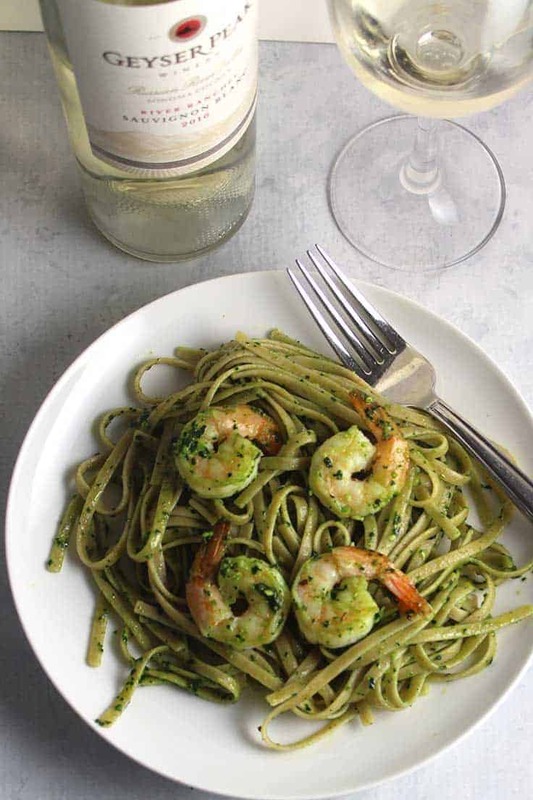 Sautéed shrimp tossed with kale pesto pasta for an easy and tasty meal. Pairs very well with a Sauvignon Blanc wine. In a medium sized bowl, combine 2 tablespoons olive oil, dried basil, garlic powder and salt. Rinse and pat dry the shrimp. Add them to the bowl with the olive and herbs, toss gently to combine. Let the shrimp marinade for about 5 minutes. Start cooking the pasta according to package instructions as the shrimp marinates. Heat 1 tablespoon olive oil in a large nonstick skillet on medium high. When hot, add the shrimp. Stir occasionally and turn when they start turning white, about 3 minutes. Cook for another 2 to 3 minutes, until the shrimp are just cooked through. When the pasta is cooked to your liking, drain and toss immediately with 2 to 3 tablespoons of the pesto, so that the pasta is coated with the pesto but you have some pesto left. Move the shrimp to a clean bowl, and toss with 1 to 2 tablespoons of the remaining pesto. Plate a serving of pasta, topped with 4 or 5 shrimp. Pass extra pesto and grated cheese at the table. Enjoy with a glass of good Sauvignon Blanc. Camilla from Culinary Adventures with Camilla dazzles with Za’atar-Crusted Rib-Eyes with 2014 Geyser Peak Walking Tree Cab. We will also hold a live Twitter chat about Sonoma wines and food pairings on Saturday, January 13, 11 am Eastern Time / 8 a.m. Pacific. Just tune into the #winePW hashtag on Twitter at that time to join the conversation. You can check out past and future #winePW topics by visiting this page. Looks yummy, David! A pesto that we can make from scratch in the wintertime – count me in. I’ve never tried making it with kale, but I think I’ll try this one. Thanks for sharing with us! yes, that is a big benefit of kale pesto. Basil is quite iffy in the winter. Pesto and Sauv Blanc a perfect pairing!!! Thanks Jeff. I do think it tastes good with pesto @ end, actually do it that way b/c my shrimp loving son can’t eat dairy. Too bad about the wine….and weather! Kale pesto is a great idea for winter pesto. The pasta dish looks delicious and I am sure was a winner with the Sauvignon Blanc. It was a great combo! The first dish my future husband made me when we started dating was a shrimp pesto dish. It’s a favorite still today. Yours looks delicious and I imagine it’s perfect with the Geyser Peak Sauvignon Blanc. Very cool memory! Similarly I made a fettuccine dish on one of our first dates and we always enjoy having that again. Too bad about the wine, David. But this pairing looks fantastic! I can’t wait to try it. And I picked up several more bottles of the Sauvignon Blanc because it paired so well with poultry and seafood. That pesto pasta looks amazing and I imagine is really would be so perfect with the Sauvignon Blanc. So sad about the other wines though! Hope your fam is all staying warm!